A couple of observations about the hairy armadillo: 1) I love animals and I love babies, but it took me a couple of seconds to convince myself that a baby hairy armadillo isn't something less than cute. And even now I'm wavering. The longer I stare, the more convincing I need. Photo source: Baz Ratner via Yahoo! 2) How have I never heard of these creatures? They're fantastic! These South American armored beasts don't get any better looking with age. It's amazing how you can take an otherwise cute-ish animal (the regular armadillo) and add some bristles and you've got something that would make you recoil if your flashlight beam encountered it in the dead of night. 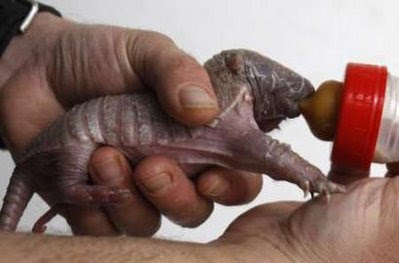 Random facts: a baby armadillo is called a 'pup.' A female armadillo is a 'zed,' and a male is a 'lister.' A group of armadillos is known as a 'fez.' Now You Know! Tell that man with the yucky fingernails to tip that bottle! The poor baby 'dillo is gonna get a gas bubble tummyache! Also, the only think that throws me off the adult is the fingers. Super creepy little hands. Other than that, I would pet them. . . but only in the direction of hairyness growth. Seen LOTS of adult armadillos, had a few try to kill me... babies look cute though. 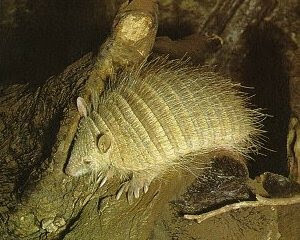 I love armadillos. They have armadillo races in Texas. I've always wanted to attend. Awesome critters. how did I miss something like that?! those two are amazing creatures, i have to say that i have always loved those "South American armored beats" i used to see some documentaries with them.